I spent the week of our Benchmark testing assessing students' sight word knowledge. All of the teachers in our school use the same list that the kids have memorized. Last year when I used it, I found that the kids whizzed through the lists and then couldn't read the words in context. How frustrating! This year, I took a different approach. I downloaded the Dolch Sight Word Assessment and Progress Monitoring Pack from Julie Van Alst at Make, Take, and Teach. Oh my! This was so easy to put together and so easy to use. The kids don't know the order of the words and have loved watching the progress they have made by graphing it. The list also goes from easier to harder words, giving the older students a lot of confidence from the get-go. If you don't have this, go grab it! It is FREE!! What I found out was amazing! The students in second and third grades do NOT know their number words! No wonder they struggle in math!!! "Three" came out as "there. "One" comes out as "on". And they couldn't even figure out seven and eight! Right now I am working on some activities with to help with number words. I plan to have that pack up by the end of the week, so watch for it! Also, "her came out as "here". And "were" became "where". Not only does this happen in the assessment, but in their reading as well. So, I added them to the word ring to practice each day and then decided we needed to really work on these words. I created a poem because I just could not find what I wanted! It focuses on the words "her" and "here". (I will probably end up writing poems for some of the other words too.) 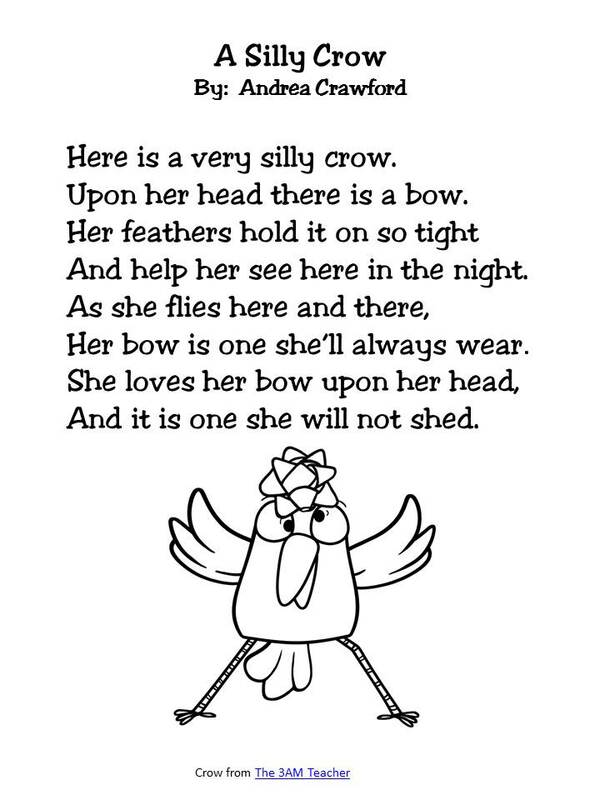 It is called "A Silly Crow" and was inspired by the Crow With a Bow Graphics from Michelle at The 3AM Teacher. You can grab it here or by clicking the picture below. I will leave you with some pictures of my weekend and what I found my kids doing! Zack lost his TV this weekend, so reading was key. Ginny Beth followed suit! Ginny Beth got a hold of my laptop today. She was "typing" away! Hey Andrea- so glad you found my sight word assessment useful. Your own children are adorable! Happy to have found your blog! I am a Title I teacher for first grade and I am always looking for more ideas. I am excited to search through yours.